A dog riding in the backseat of a car, wearing a harness. Photography by peplow/Thinkstock. Allowing canines to wander the car freely is a big no-no when it comes to dog car safety. Unrestrained dogs face the same injury risks as human passengers not wearing seatbelts. A hurtling hound also becomes a forceful projectile that can injure others. And if your pup flies out the window and onto the road, it could cause a multi-vehicle pileup — and serious injuries. Last but not least, loose dogs in cars become distractions, and distracted drivers cause accidents. These days, most well-stocked pet stores carry car harnesses designed expressly for dogs. Unfortunately, not all of these products are approved by the Center for Pet Safety (CPS). While the CPS Certification program is voluntary, it means a harness has been crash test-certified to rigorous standards. Approved products always carry the CPS logo. Look for dog car seats that can be tightly secured so they won’t slide around. Plain and simple, a dog running loose in the back of a moving pickup truck is a tragedy waiting to happen. The Humane Society of Utah has estimated that 100,000 dogs are killed annually because they either jump or get thrown from a pickup. Dogs in hot cars is a huge dog car safety issue. The Humane Society of the United States (HSUS) reminds pet owners that on a mild 72-degree Fahrenheit day, temperatures inside a car can skyrocket to 116 degrees F within an hour. On an 85-degree F day, the temperature can hit 102 degrees F in under 10 minutes. Cracking windows is useless against such a ferocious heat onslaught, which can rapidly cause brain damage or death. On the flip side, canines have also died of hypothermia when left unattended in cars during winter. When you’re operating a two-ton vehicle, a pet sitting on your lap can cause dire distractions. Even a brief collar adjustment or ear scratch can have catastrophic consequences. If you need to maneuver quickly, arm movement may be restricted. Should you hit a harsh bump, your canine could be crushed by a deployed air bag. Dogs don’t sweat the way humans do. They only perspire through their paws and reduce body temperature by panting. So always provide a bowl of fresh, clean water in the car — regardless of the temperature outside. Water cools the mouth area and helps keep your pooch hydrated while you drive. Each time you coax your furry friend into the back seat, where do you wind up? If you answered “vet’s office,” your canine will likely come to dread any car ride. Dogs in cars only work when you make road trips more enjoyable. Motor out to a local nature area — or heck, just around the block. Turn on the radio, but not too loudly. Ask a friend to tag along so he or she can offer pooch-pampering reassurance. Some dogs simply struggle with motion sickness. If that’s your situation, don’t feed your furry friend right before hitting the road. Always take along an emergency supply of rags, poop bags and nontoxic cleaning solutions. Also, ask your vet to prescribe anti-nausea medications to make your jaunts less jarring. Yes, your pooch loves the fascinating sea of smells that drifts along on the open air, but hanging his head out the window can harm him and passing vehicles. Open the window just a crack for a tease of that fresh air, but be sure he can’t stick his head out (or worse, jump). Understanding what’s dangerous to your canine is important because states have different ways of defining what’s actually illegal. Make no mistake: Depending upon where you travel, certain actions concerning dogs in cars earn anything from a citation to a felony charge. Michigan State University College of Law publishes a handy table outlining state laws designed to protect unattended animals in vehicles. Keep in mind, however, that even in states where no specific laws exist, local ordinances may be in place. In addition, a growing number of states like Massachusetts and California are beginning to regulate how dogs can be transported in pickup beds. Hawaii prohibits motorists from driving with dogs on their laps. New Jersey police who feel that “improper pet transport” is occurring are free to cite the driver. And just in case you were thinking of leaving Rover in your running car with the A/C going full tilt, know that several municipalities may ticket unattended cars left idling. In short, appreciate what’s illegal; but also understand what’s risky, unwise and flat-out inhumane. Dogs trust us to safeguard their welfare. We owe them conscientious care — no matter where life’s journey takes us. Tell us: What are your tips to keep in mind with dog car safety? Tell us in the comments! 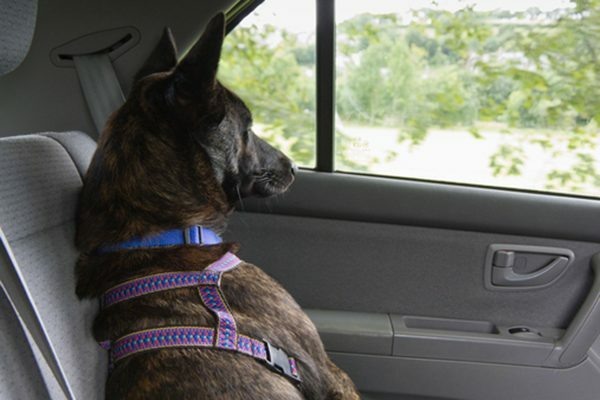 The post Dog Car Safety: 10 Things NOT to Do appeared first on Dogster.